At 24sessions we offer 3 pricing plans: Basic, Standard and Premium. The prices included are for annual billing, however, you have the option to pay monthly as well. 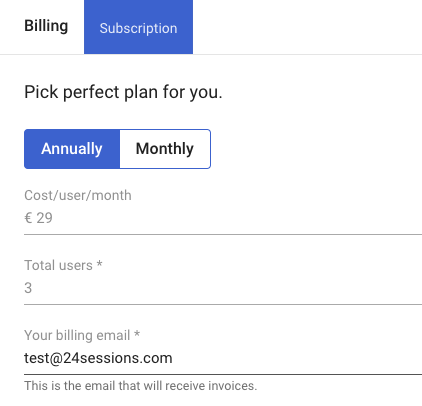 You can see the monthly vs yearly billing in your account's 'Billing settings' --> 'Update plan' in both us dollars and euros. You can start a free trial and then upgrade to the plan that best suits your needs. Please note that if you have upgraded your account before your free trial ends, you will still receive the remaining days for free! If you click 'Upgrade Now', you will be redirected to Billing where you can first choose whether you would like to have an annual or monthly (cancel after 1 year vs ability to cancel every month) subscription. Simply switch between the tabs annually and monthly based on your preferences, and the prices will be adjusted accordingly. 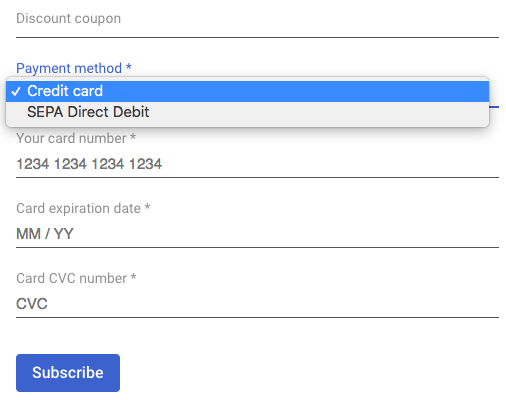 To enter/change your billing address, simply add/overwrite your preferred address in the "Your billing email" line. You will receive the invoices on this address. Hereafter, you can enter a discount coupon if you have one. Please feel free to contact us for any bulk discounts. You can select your preferred payment method (Credit card or SEPA Direct Debit) and enter your bank payment details. Click "Subscribe" to save your settings.